The Appalachian Trail originated as a vision in 1921 by Benton MacKaye, a US Forest Service worker. Commonly referred as "The Father of the Appalachian Trail," MacKaye's initial idea came to be after observing a rapidly industrial and urbanized post-World War I America. Believing such an environment had detrimental effects on the citizens, MacKaye proposed a plan to construct a natural scenic trail to reintroduce man to nature. Benton MacKaye is widely considered the visionary of the AT; however, it was Myron Avery who was responsible for the trail's construction. With the help of volunteers, local clubs and national organizations, among them being the Appalachian Trail Conference (founded in 1925 and later renamed the Appalachian Trail Conservancy) and the local Civilian Conservation Corps, Avery set out to blaze the trail from Mount Oglethorpe, Georgia to Mount Katahdin, Maine. By 1937, the trail was completed, though maintaining the trail and conserving the land would prove to be a difficult challenge for the federal government once authority began to transfer from private land owners. The southern terminus of Mount Oglethorpe would later be changed to Springer Mountain in the 1950s, an example of the difficulties regarding the maintenance and conservation of the Appalachian Trail. 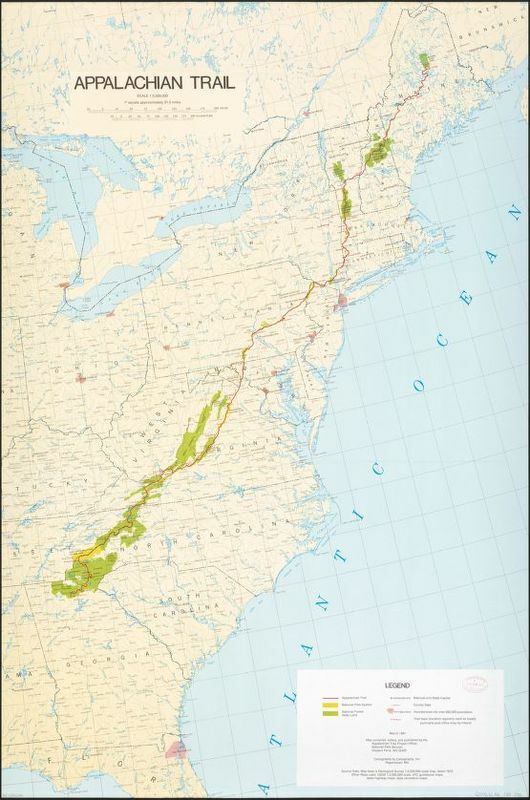 In 1968, the National Trails Act was passed by Congress, allowing the federal government to proceed with acquiring the remainder of the Appalachian Trail Corridor, shifting the trail into the National Park Service's control. Unfortunately, it would take another ten years before the act was amended, giving the federal government power to relocate sections of the trail that were threatened by the construction of roads and other types of developmental zones. A path leading out of Damascus onto the Appalachian Trail toward Feathercamp Ridge. To provide workers with the opportunity to partake in recreational activities, MacKaye proposed the creation of shelter camps, farming communities, and industrial communities along the trail. MacKaye wanted the camps to become small communities in their own right, where American workers could spend their vacations and ultimately produce their own sources of food. The camps would transform into agricultural centers and because of their close proximity to natural resources, the small towns could properly develop, eventually expanding into new communities instead of becoming larger ones. If anything, this was MacKaye's way of reintroducing man back into nature and the existence of the Appalachian Trail served to deconstruct the notion of a massively industrialized society. The AT goes through the town of Damascus and interestingly, Damascus is the only community where the white blazes are painted throughout the town, guiding section and thru-hikers instead of signs. While MacKaye's original vision entailed the creation of cooperative and self-sustaining towns, the way Damascus sustained itself over the years is peculiar. Instead of people staying and developing the town further, the population of Damascus saw a decline during the Great Depression and World War II eras. By the late 1980s and early 1990s, the town experienced a revival of sorts, thanks in part to environmental concerns, an improved attitude toward outdoor recreation, and the creation of Trail Days. 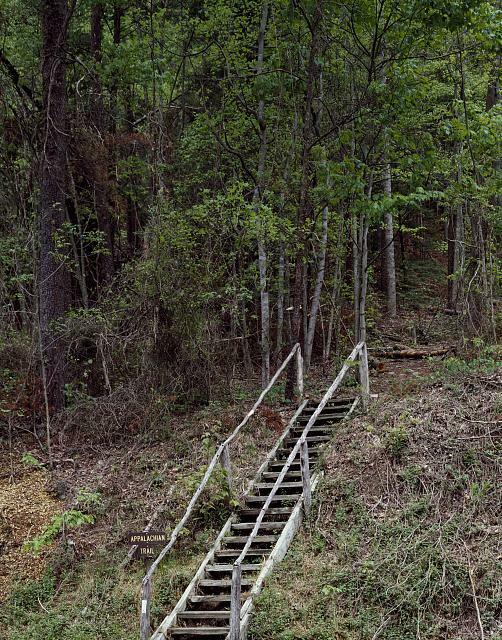 An influx of tourism helped economically support the town, ultimately contributing to the maintenance of the trail through volunteers and local clubs like the Mount Rogers Appalachian Trail Club. As a result, there is a symbiotic relationship between Damascus and the AT as the town depends on the trail both economically and culturally, while the same applies to the Appalachian Trail in regards to the various communities that provide services to hikers and tourists. Altogether, trail towns like Damascus are important to the survival of the Appalachian Trail and vice versa.